Posted on June 24, 2015 by Barry V.
I find my way to one of Mass Audubon’s newest properties in Wareham this afternoon. The signage, trail maps and interpretive panels are top-notch! I’m aiming for a water view today, so I head out to the Osprey Overlook off the Heron Point Loop Trail. The path takes me through an attractive coastal forest dotted with majestic white pines. Brown creepers and pine warblers sing from the trees overhead , while towhees sound off from the huckleberries below. Osprey Overlook lives up to its name – within minutes an osprey floats overhead, and I can see the nest on a platform across the marsh. 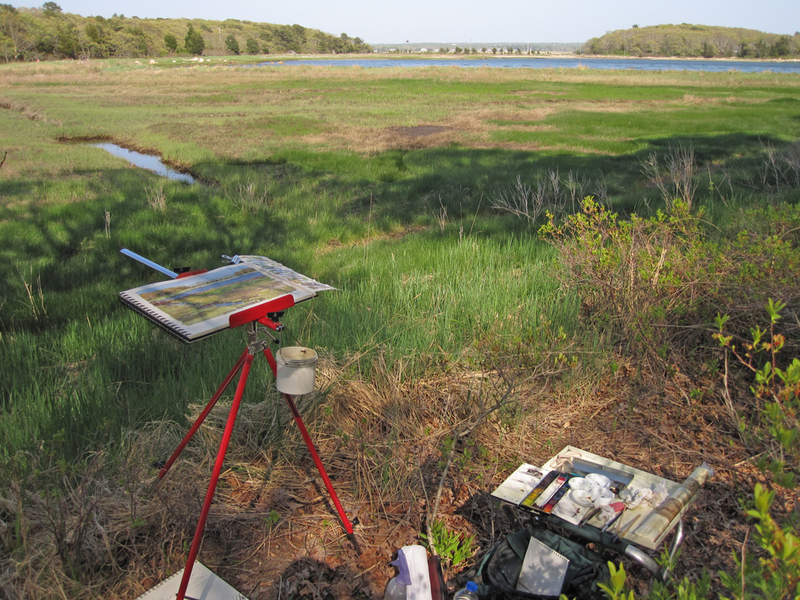 I set up a field easel in preparation for some landscape painting, but keep my sketchbook nearby to record the shapes of the osprey during its numerous fly-overs. I’m planning to add the bird to my painting. Foliage on the Cape is at least a week behind inland areas, and here the landscape still has the soft tonalities and subtle colors of early spring, which are set-off nicely by the ultramarine blue waters of Bass Cove. As I paint, a willet makes a noisy visit to the nearby shoreline. Technical note: when I started this landscape painting, I was in full shade from the trees behind me, but as I worked the sun began to dapple my watercolor pad. It’s always best to have the watercolor paper in shade while painting on location (and some artists carry an umbrella just for this purpose), but that’s not always possible. You can paint with the paper in full sun if you take care to compensate for the brightness of the sheet, but the worst scenario is to have your paper partly in the sun and partly in the shade. Here, I finished the landscape by blocking the direct sunlight with my body, so the page remained in full shade. 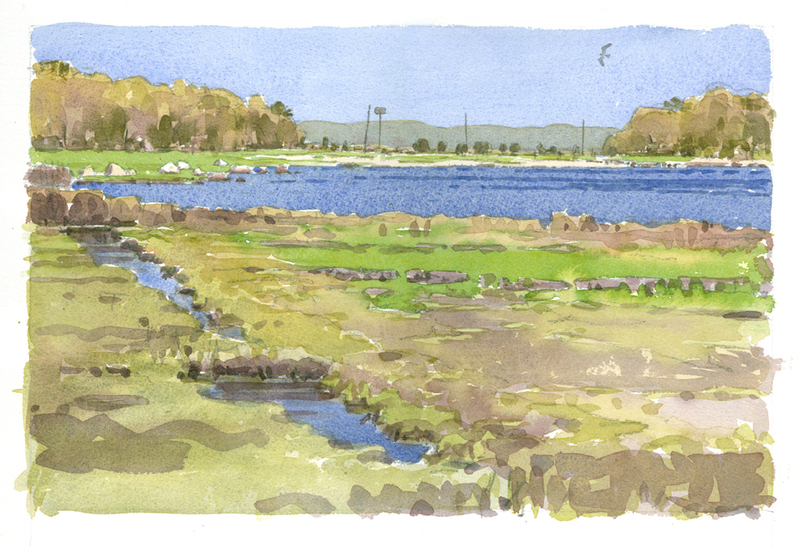 This entry was posted in Artists, Barry Van Dusen Residency, News and tagged Barry Van Dusen, Birds, Great Neck, Great Neck Wildlife Sanctuary, Osprey, Osprey Point, Wareham, Watercolors, Wildlife Sanctuary on June 24, 2015 by Barry V.. In my job I get a flood of emails daily , but every time I get a Taking Flight post I open it no matter what I’m doing. It’s a great break from my normal work day. And, I get to live vicariously through your reports and your art. Thank you and keep them coming. Thanks for the thoughtful and wonderful comment, I’m so glad to hear that these posts brighten up your day.